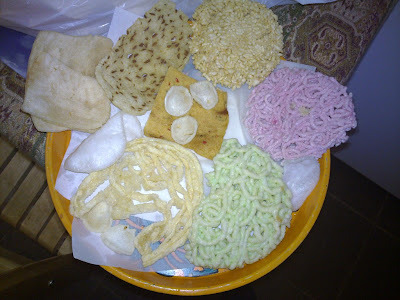 The picture above shows a selection of Indonesian krupuk that Mrs K cooked last year after a friend in Holland sent her a selection. I have no idea what's in most of them, and the colours look a bit dodgy (the big round ones are rice-based), but they all taste great. We actually got the krupuk for this recipe from our local small Chinese store - it's always been difficult to find Indonesian varieties, but the times seem to be changing. The small white ones we use are similar to the pre-cooked ones you may be familiar with, but when shopping try a few different varieties as they vary greatly - and most are awful. 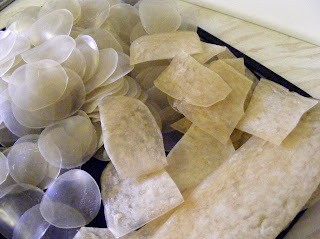 The large rectangular ones (on the right of the picture below) are branded Sidoarjo, an Indonesian company that actually has a krupuk blog, albeit abandoned. The only ingredient you need is, unsurprisingly, cooking oil (Mrs K always uses sunflower oil). But Mrs K has another trick that she swears by (not that Mrs K ever swears. Ever). This involves kemiri, known here as candlenuts. These are ground and used as a thickener in many Indonesian recipes, but in this case Ms K just pops a whole one in the oil - she reckons it makes the krupuk retain their crispness for a couple of days longer. The Wai Hee Yong online store sometimes has these in stock, but we found some in a store in London's Chinatown. They're not essential for krupuk, though. Pour about 1.5 litres of oil into a wok or large saucepan. Heat it on a high flame until a slight haze is visible, then reduce the flame a bit. The easiest way to tell whether it's hot enough is to pop in a small piece of krupuk - almost immediately it should expand. Put in small quantities at a time and take care - remember these things expand massively. As soon as they stop expanding, they're ready. Take them out with a strainer and pop them on some kitchen paper to soak up excess oil. 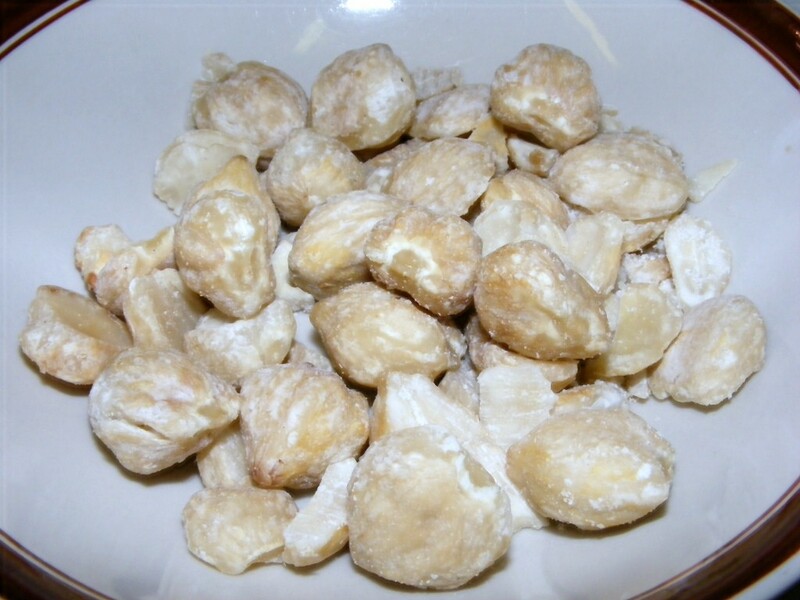 Store them in an airtight container and they should stay crisp for at least 4-5 days. As you can tell from the video, Mrs K still enjoys cooking krupuk - there is always something magical about the transformation.